The whole, as we say, is often greater than the sum of its parts. So true in the garden this spring, as I watch bulbs that have for years come up drearily in the same place only to take on more significance with the fall planting of various evergreen shrubs. 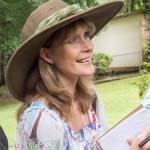 Pairing plants for maximum effect is no new trick, but for many amateur gardeners out there, pairing plants specifically for the winter doldrums is not the first consideration when traipsing up and down the clearance aisles in late fall. It should be. Some of you will need some convincing. For one, there is the simple fact that you have no intention of visiting your gardens in the winter. What use have you for a February massing of Lenten rose (Helleborus x hybridus) against the timeless beauty of English Holly in full berry when you’ll be inside scrapbooking summer beach memories? I cannot blame you. These little winter miracles must be seen to be believed – and most of us hard-core horticulturists do so in the driving sleet, sighing through our clenched teeth. Yet bear with me, for there is a certain time of year, specifically this time of year, when one’s mental health can be drastically improved by the clever pairing of sturdy flower and winter reddened stem – and all it takes is a little planning. When spring is on the calendar but not in the air, and winter is never-ending, it is well to have a back-up plan. A spring garden must have daffodils (it is no doubt written somewhere), and for years I have grown the low lying tête-à-tête narcissus to avoid foot-long browning foliage in June. Yet every March, when my California siblings sing songs of green hillsides covered with the orange cast of poppies, I look out of my window only to see these little troopers stalwartly holding up a wasteland of a garden on their puny shoulders. Everywhere, desolation. Everywhere, gray…and brown…and gray again. Except of course for these little bunches of yellow optimism here and there throughout an apocalyptic landscape. On a very cold day (such as we have had for weeks), it has always had the curious effect of annoying me. I have felt their boundless, if diminutive, energy wasted somehow – tête-à-têtes with no one to talk to. How exceedingly ironic. Finally fed up, I marked their spots last spring, dug up others for replanting and headed to the nursery – determined to find sympathetic friends worthy of their confidences. Today, a new season dawns and shrubs such as Chamaecyparis pisafera “Gold Mop”, Euonymus aurea-marginata and various ilex and boxwood act as evergreen backdrops to the bright spots of yellow filling a chilly March. Now these little cheerleaders cheer up rough purple hedges of heather and encourage the green stems of scotch broom to set blossoms in anticipation of a warm April. They are no longer forlorn and lonely – forced to wait for the recalcitrant shoots of fair weather friends. They are no longer wasted. 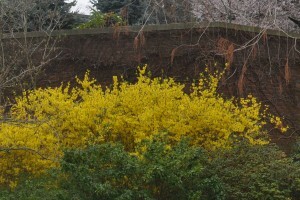 Forsythia is given added emphasis situated between greening azalea and a brick wall – in a few weeks, the azalea will return the favor. 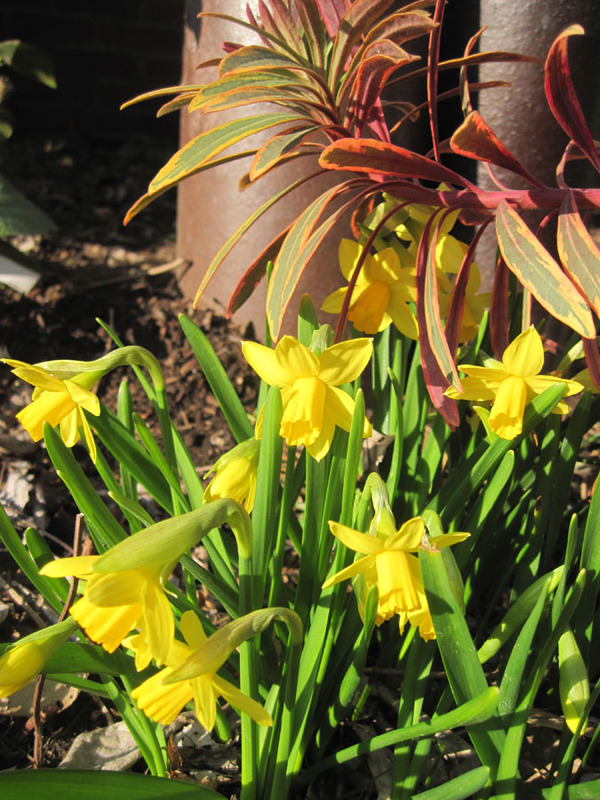 In a small-scale garden, early spring pairing should inform your planting decisions. It’s all about how you maximize the space you have. Snowdrops massed in abundance under a large tree is magnificent on a large estate, but a few snowdrops are not wasted if placed at the feet of a red twigged dogwood (Cornus sericea). Back those dogwood with two or three paperbark birch and you’ve got whites playing intimately with reds and making your early spring landscape feel like early spring – not late winter. Ideally, your plantings should involve the spring burst of a blossoming tree, plant or shrub, against the foliage or stems of a winter beauty – signifying the return of spring without having to wait for the lilacs to wake up. Dwarf hamamelis against osmanthus, Daphne against early daffs, winter aconite swirled with Arum italicum. And if you ice the cake with a generous re-mulching or re-gravelling, you may wonder how you ever survived as long as you have without maximizing the early spring garden. March is tough in the Mid-Atlantic (especially if you have family in warmer climes). It should be spring…we want it to be spring…but spring has plans of its own. Take matters into your own hands by building upon the incredible diversity of blossoming plants that we do so well back here and start the season early and successfully. Pair up and cheer up. 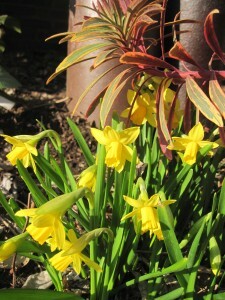 I paired daffodils with hellebores, and it worked very well. I did this by accident, not intentionally. And I like the result. Happy accidents are such pleasant surprise. Agreed! Throwing a few more hellebores in this season. Fell in love with the strong upright heads of “Pink Frost” at the Philly Show. I couldn’t agree more about the impact of pairing. Though I must confess that my best pairs have been purely serendipitous. I especially like Chionodoxa and Anemone blanda ‘White Splendor’ that have been coming up together reliably for 35 years now. Primula vulgaris and Crocus tommasinianus ‘Ruby Giant’ are a spectacular combo and completely carefree. Did I sit back and say ‘let’s see, vibrant purple and yellow/white would look outstanding together’? Nope, I said it’s November and it’s cold outside and where can I put these crocus where they will do better than sticking them in the lawn (as I was often wont to do). Mother Nature knows what she’s doing sometimes John! Serendipitous pairings are fabulous in the summer garden, but oh-so-special at this time of year, eh?